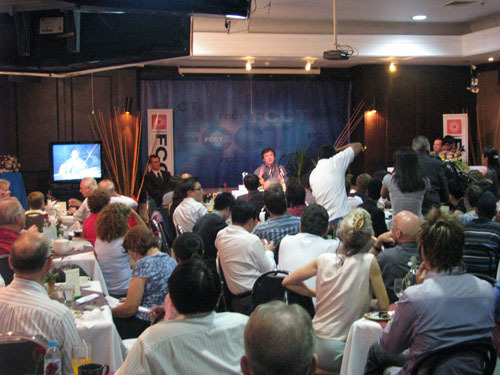 A journalist attending an event at the Foreign Correspondents Club of Thailand during Jackie's recent trip there was given quite a surprise when Jackie sang Happy Birthday to her. A longtime fan, Lynette has allowed us to reproduce the article she wrote about her special day. Jackie Chan sang me the last bars of the 'Happy Birthday' song! The fact that it was totally unexpected just made it all the more surreal! Ok, lest I be misunderstood, let me put the whole thing in context. 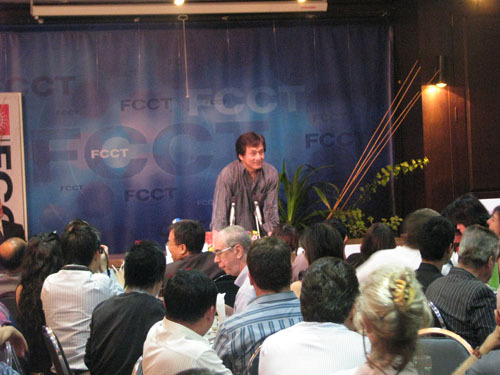 Jackie Chan was the guest speaker this evening, Nov. 9, at the Foreign Correspondents Club of Thailand of which I am a member. I almost missed it had it not been for our regional correspondent reminding me about it. So, a quarter before 8 p.m., I quietly slipped into the already crowded -- actually, SRO -- FCCT. As fate would have it, I realized I was standing in the path where Jackie and his 'handlers' (read: burly men in black) would be taking on the way to the stage. Thus, it was my luck that I was able to take a few seconds' of video of him coming in. And so the event commenced, with me trying to make up my mind whether or not to ask him a question. The microphone was open to anyone who would dare and already, a long queue had formed. What the heck, I told myself. You've waited this long and now you're just going to stand there?, berated an 'inner voice'. So I did move, calmly positioning myself at the end of the line. Moments ticked by and I found myself inching closer and closer to the mike. Oh and yes, my hands got clammier and clammier, my heart beat faster and faster — symptoms of a star-struck fan. Finally, it was my turn. And to my surprise, I suddenly became very calm and it seemed that everyone just fell silent. That was my moment to blurt out what I had wanted to say all along. "Hi, my name is Lynette... and I work for... It was my birthday yesterday and this is a gift for me, finally seeing you in person. For the past 27 years, I've always dreamed of seeing you in person and now it has come true... I've always been a fan. Oh, by the way, I've watched Drunken Master 13-15 times...," I told him with nary a hint of embarrassment. There was a brief pause from Jackie, as if trying to let the words sink in and quite suddenly, he jumped up from his seat in his typical, hyper way, and quipped, "Is that your question? Ok..."
And, of course, I said, "No, my question is this..." and proceeded to ask him how being a media personality, adored and even made a hero by the industry, is also a double-edged sword in that he also sometimes fall prey to the machinations of the media. "How difficult is it for you to deal with a media that politicize some of the statements you made in public? 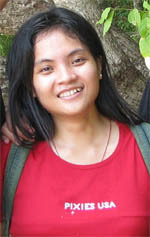 We all know that environmental issues also have political implications," I queried. He sighed and turned serious, saying that he hates politics and that he does find it disconcerting and frustrating if the media start giving political meaning to the things he says or does in public. "But [my fans can tell that] I don't like politics... that I always do things with heart and with love. Love is important and that's what people see...," he explained. He expounded some more before saying, "And... and...," he announced, pausing for dramatic effect and making his point by raising his right forefinger as everyone fell silent, waiting for what he was going to say next. "HAPPY BIRTHDAY TO YOU!" 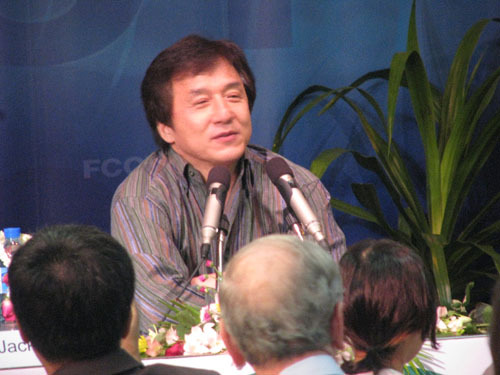 Jackie sang loudly, looking at me with a wide smile, as the audience burst into a hearty applause. It was totally unexpected and you can just imagine my surprise and delight at hearing my childhood idol sing me an impromptu birthday song. I ended up having this wide-eyed, open jaw expression and I instinctively covered my mouth in disbelief. To top it all, I was the last person allowed to ask questions so it was a fitting finale. The angels must have grinned from ear to ear at the sight. It might not be much but it was a marvelous gift enough for me. Once again, the universe must have conspired to finally say 'yes' to a most cherished dream. I might not have had a picture taken with him (all because of those burly 'men in black' who briskly shoved away all those blocking the actor's path after the event), but that brief 'exchange' where he looked at me and shared his thoughts — and of course, humoring me with his birthday greetings and standing an inch or two away from him on two occasions — was good enough for me and which made me feel as if my feet were not touching the ground. Never mind that he'd surely forgotten all about it as soon as the event ended. Still, dreams do come true after all. Now, if only the universe would hurry up and make my dream of meeting H.H. the Dalai Lama come true much sooner, I'd be doubly happier...crossing fingers!